From Mediaite: Jamie Foxx wore a Trayvon Martin t-shirt to the 2013 BET Awards. Foxx has been an advocate for justice for Martin. 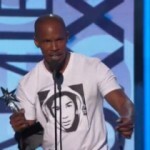 Reports Mediaite, “During Sunday evening’s BET Awards, actor and musician Jamie Foxx continued his streak of outward support for Trayvon Martin, donning a t-shirt with the late teenager’s face presumably advocating for the conviction of accused murderer George Zimmerman. Foxx’s tee shirt first made a splash during the pre-show red carpet interviews, but it took center stage when the actor accepted the Best Actor award for his performance in 2012′s smash hit Django Unchained. Despite the clear statement via his outfit, Foxx did not specifically address Martin’s death while accepting his award.” Read on here. From Gossip Cop: Demi Lovato opens up in the August issue of Cosmopolitan about her early “struggles” and how she deals with them now. Gossip Cop reports, “She says, ‘When I look at someone who’s out there partying excessively or rappers rapping about doing drugs, who people look up to, and think, ‘Oh that’s a G; that’s a gangster.’ I think, ‘You’re actually being a giant p*ssy.” ‘Sorry, but those rockers in the ’80s were the furthest thing from rock stars. They were so insecure and so lonely that they had to do these things to get them through the day,’ contends Lovato. The ‘X Factor’ judge adds, ‘If you’re spending your entire early 20s chasing the next party, what are you running away from? That’s not a badass. What’s a badass is when you can sit through your problems and feel emotions when you don’t want to have them. '” Read on here. 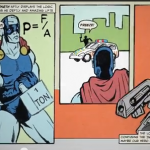 From Geekosystem: TED-Ed cartoons explain why you wouldn’t want superpowers in real life. Geekosystem writes, “Over the weekend, though, TED-Ed expanded its purview and blew our minds with seven great videos exploring how common comic book superpowers — real classics like flight, super speed, and super strength — would operate in the real world. The disappointing answer? Not very well, as the offering on super strength demonstrates here. While the physics lesson on super strength may be no huge revelation to seasoned comic book nerds — most of whom will recognize it as ‘pretty much exactly how Gwen Stacy died’ — the whole series is pretty excellent, and will make you feel a lot better about the fact that you don’t have superpowers.” Read on here. From Styleite: Nicole Kidman sports a fiery new crop style for Jimmy Choo. Reports Styleite, “It seems that Nicole Kidman has caught some of that Nashville fever, and she wears it well. The Oscar-winning actress stars in Jimmy Choo’s Fall 2013 campaign, which was shot in the Music City the day after she attended the We’re All for the Hall concert hosted by her husband Keith Urban to benefit the Country Music Hall of Fame. In the first of the two ads, Kidman sports a new razor-sharp cropped hair cut, with a bolder shade of red than we’re used to seeing, while donning a very film noir trench coat dress, scarlet cage heels, and a leather clutch. In the second, she’s sitting in a vintage convertible in a body-hugging black shift, showing off a pair of moss green leather ankle boots that have us aching for fall.” Read on here. From SportsGrid: Brazil crushed Spain in the Confederations Cup final yesterday. Reports SportsGrid, “Having won the last World Cup and two consecutive Euro tournaments, the Spanish national team has been dubbed ‘the greatest team in the world’ by many, including their Brazilian opponents. Some might even say La Roja is the greatest of all time, in any sport. Well, that run might be over after Brazil dominated Spain in the Confederations Cup final yesterday. Their 3-0 victory came easily, especially when the first goal came in just the second minute. Brazilian striker Fred (Fred!) put it home after a scrum in front of the net. Although no one really cares about the Confederations Cup, this makes for a good warmup for Brazil with the World Cup right around the corner.” Read on here. From The Mary Sue: The Mary Sue reviews Neil Jordan’s Byzantium. The Mary Sue‘s Zoe Chevat writes, “If the summer’s glut of sequels and reboots has got you down, then interest, if not a feel-good time, may be found in the art house. Byzantium, a return to the vampire genre well-trod by director Neil Jordan in High Spirits and his more famous Interview with a Vampire, is a curious piece, at times slow and ponderous, bookended by violent, swift action. It brings Jordan back to a theme he explored in Vampire; the consequences, and perpetual loneliness, of the cursed immortal. The difference here is that the subjects of Jordan’s very modern supernatural tale are not statuesque vampires in sharp suits and gleaming jewels, but a mother-daughter pair, sleeping rough and on the run.” Read on here. From The Jane Dough: Greg Haney tells his story of how he pays for his life with his credit card rewards. 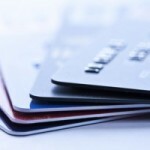 The Jane Dough explains, “The negative perception of credit cards is completely wrong. So many money experts tell people not to pay with credit cards, which is crazy and the opposite of what smart consumers should be doing. The real problem isn’t with credit cards; it’s the consumers who choose to carry a balance. Paying off a balance in full each month will result in no fees or interest, plus accumulated rewards. My strategy is helping me earn another free adrenaline-filled trip … this time to New Zealand! I have three simple steps for using credit cards. Step one: Use credit cards for every purchase possible. Step two: Always pay off balances in full each month. Step three: Profit!” Read on here. From The Braiser: Celebrity chefs are really into using the “n-word” these days. 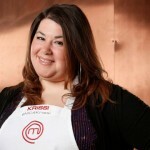 The Braiser reports, “First, there was that Entire Paula Deen Thing, and now, we wake up to find that MasterChef Season Four frontrunner (both for cooking and for sass) Krissi Biasiello made some very public, very derogatory tweets about black people. The worst part is, she might actually beat Paula Deen in terms of nastiness. Where Deen’s racism comes off as misguided obliviousness, Krissi’s statements towards black people — in keeping with her character on the show as a verbal steamroller with an attitude — are of the blatantly hateful variety.” Read on here.